HAMILTON — Like many preschoolers, Alexander Cuevas heads off to school every morning wearing his trusty backpack. But Alexander’s is no ordinary bag packed with books and crayons. His backpack provides crucial life support, supporting his digestive system with a pump that feeds him through a nasal tube. For 15 hours a day, the device feeds him a total parenteral nutritional fluid that lets him bounce around like most 5-year -old boys, his mother Anivel Rivera said. Alexander was born prematurely, and was initially “nothing out of the ordinary,” his mother said — until he developed necrotizing enterocolitis, the most common gastrointestinal disorder in premature infants. The disease kills tissue in the intestines, and in 30 percent of cases, there is significant damage to the intestines and surgery is required to remove portions of the digestive system. Alexander has been under the care of doctors at the Children’s Hospital of Pennsylvania and is a student at a Head Start program in Hamilton. Rivera said the school is perfect for her son, because nurses are on hand if he needs them. Other schools weren’t equipped for the challenges, she said. The pump system, while essential, is not a long-term solution for Alexander. The Children’s Hospital of Pittsburgh has just informed his family that he has been approved for a colon transplant, Rivera said. He is on a waiting list for a donor and the family is prepared for the surgery, which will be followed by multiple checkups per week for 4 to 12 months. After the transplant he will need to take immunosuppressant drugs for the rest of his life. To help the family with their mounting medical bills, neighbors in their apartment complex have organized “Kisses for Alexander,” holding community yard sales and selling candy to raise money. Emma Yasinski went to one of the yard sales last year with her boyfriend Anthony Mango and was immediately taken with the boy’s story. They asked organizers Meg Molnar and Sally Vujisic how they could help. Yasinski and Molnar are both avid runners, participating in 5K races around the region. 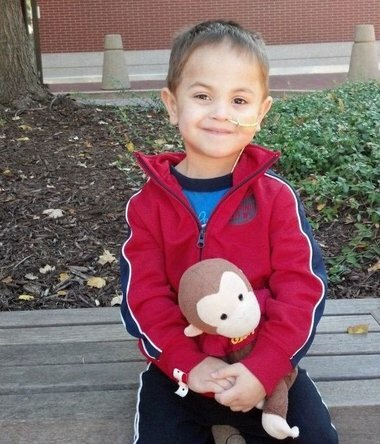 They decided to organize a race to raise money for Alexander’s medical bills. The All for Alexander Halloween 5K will be held at Mercer County Park in West Windsor on Oct. 27. “Alexander’s family melted our hearts immediately and we wanted to do something to help,” Yasinski said. Registration for the 5K is $30 for adults and $15 for children under 12. The cost of the adult one-mile walk is $25.